In my view the most dangerous of all weapons in a hand to hand situations is the knife. I have had the misfortune on being involved in this situation twice in my life, and my skills saved me both times. The first was a razor style box knife. Knife defense takes training and lots of it! 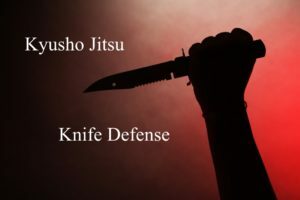 This new eBook is being titled Kyusho Knife Defense, and it will certainly have the best ways to use Kyusho in a knife attack, but it will also be covering much more! What is covered in this NEW eBook? Quick and safe knockouts to end the attack ASAP. Proper methods to avoid the knife and gain the upper hand! Movements and understanding distance as it pertains to knife attacks. Special Training Videos links to teach both attack and defend! These will only be available to those who own the eBook! Knife defense is not pretty, this eBook would be remiss if it did not cover more than just the Pressure Point Applications. Therefore it will cover EVERYTHING I have been taught about knife defense and Kyusho application over the years! Plus there is a special introduction in this new book by a retired police officer who serves with the Detroit / Windsor / Ontario Provincial Police over her years of service.